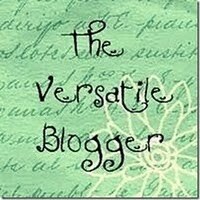 Michele from Tierra Verde Handmade Soaps has kindly nominated my blog for the Versatile Blogger Award! If you do not currently follow the Tierra Verde blog, consider it if you own a small business. She is constantly posting business tips and information on how to run a small business. She is so helpful! Her soaps are also very beautiful. Check out her website by clicking here! 1. I am going to be moving out of my parent's house in about a month and moving into an apartment closer to the KSU campus. 2. My all time favorite food is green bean casserole. 3. I am super scared of roller coasters. Absolutely will not ride one. 4. My sister just found out she is going to have a baby! I'm an aunt! 5. I used to ride horses. I did eventing - dressage, cross country, and stadium jumping. I miss it. 7. I love painting my nails. Check out these awesome blogs!! I took a double take when you mentioned KSU. That's short for Kansas State Univ. around these parts. LOL! Roller coasters freak me out too - I'm happy that my husband doesn't mind taking the girls. They love them!